Watching them drive away was not easy. Emmy kept on crying. Hoping that Ed would be able to distract her, I walked back to the hotel. Later that night, Ed informed me that Emmy had cried the whole way home. She is one stubborn little girl. Despite those twenty minutes of tears, she survived quite well without Mommy for the rest of the weekend. 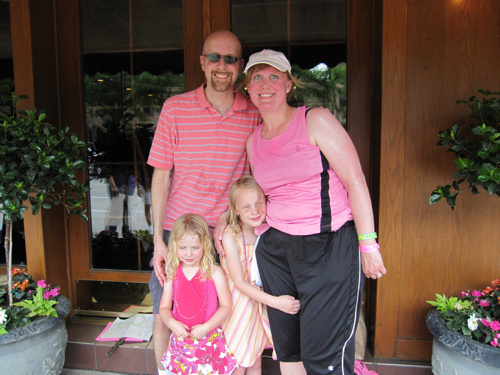 Ed and the girls came to cheer for me at mile 14 on a hot, humid Chicago day. Lily brought a spray bottle to spray walkers…smart girl! And they also met me at the finish line on Sunday. Emmy was a happy little girl all weekend long. Monday morning I found a drawing in the car. 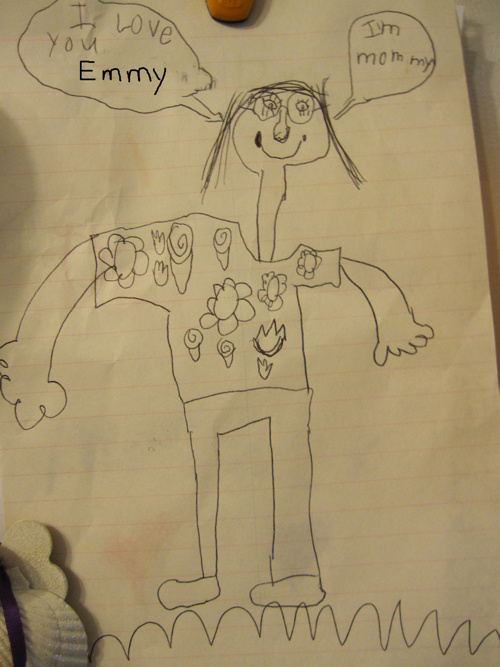 I soon realized that Lily had drawn it for Emmy on Friday night to help Emmy feel better while she was missing me. Sweet girls indeed! I love drawings kids create! Ok, that is too sweet that she drew Emmy a picture. Glad you had a great weekend (woo hoo for going! You rock!). What a sweet drawing and well done you for doing that walk! That is so sweet that she cared so much as to make her a drawing!!! :)Glad the walk went well and you had your family waiting for you at the end. What little darlings! (I love that your bigger picture moments are so often about your girls and what you all mean to each other :))And good for you for walking for such a great cause! Ginny what a heartwarming story. The picture is priceless! How wonderful that the girls were a part of the experience and that you were able to blog about it. What a sweet little story and how cute of Lily to draw the picture.I love that they came and watched you. Oh, that so warms my heart! What sweetness between sisters! So the 2-day went well for you! It was intensely hot for walking. So proud of you for doing it. Also, you look GREAT! Aww! What sweet girls you have! I love how the picture says "I'm Mommy" on it! LOL! Too cute! That's adorable! B drew a similar – though not as clearly recognizable – picture for T one day when I was out running errands and they stayed with Daddy. Gotta love those nurturing instincts! How wonderful and thoughtful of her! I love that. Visiting via Bigger Picture Moments.